Even the most casual of history buffs understands that Jefferson's role in the Civil War was only as a manufacturing and supply depot for the upstart Confederate States of America. re-enactment of that era in Texas. 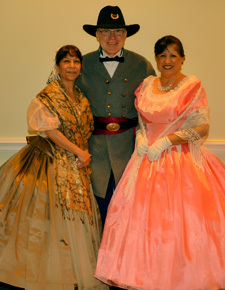 More than 700 Civil War period reenactors - soldiers and civilians both - are expected to descend upon the town the weekend of May 3rd - May 5th, 2019 to enact "The Battle for Jefferson," a two-day tilt between Confederate and Federal forces that is largely played out at Bob and Kimmie Sanders' nearby Cypress River Ranch. Infantry, cavalry and artillery all play a part in the scenario battle that gives life to what might have happened in and around Jefferson in 1864 had Union Troops been successful in the Red River Campaign and captured Shreveport. 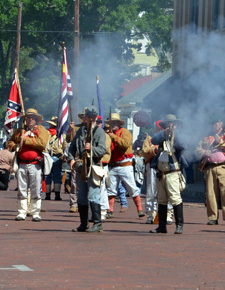 Coupled with the Jessie Allen Wise Garden Club's annual Pilgrimage, the "Battle" portion of the weekend has succeeded in turning Jefferson's downtown historic district and surrounding neighborhoods into a three-day living history encampment. Nearly all of the troops and civilians are camped in town in full view of the visiting public. Others are camped near the battlefield at Cypress River Ranch. 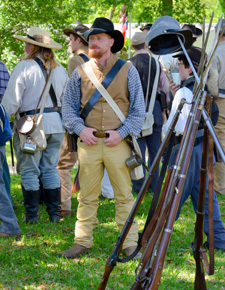 Jefferson celebrates American history by hosting the largest Civil War reenactment in Texas.